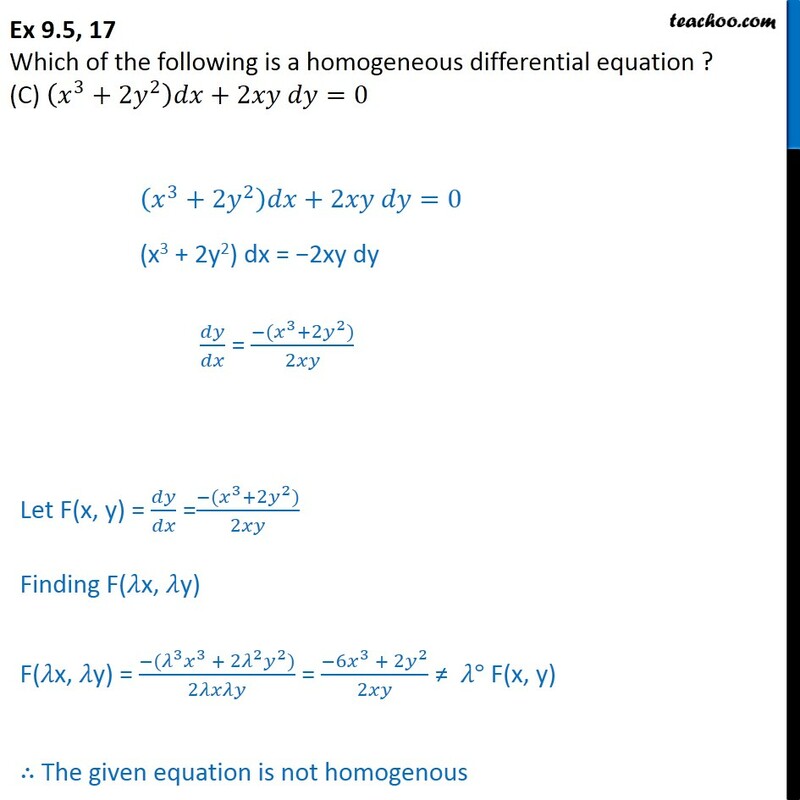 Ex 9.5, 17 Which of the following is a homogeneous differential equation ? 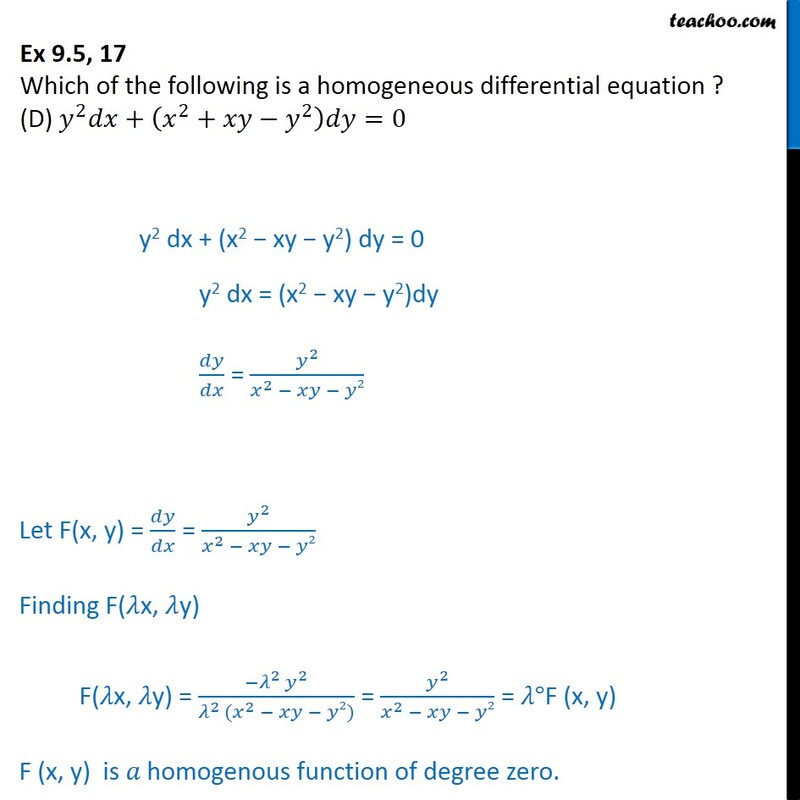 (A) 4𝑥+6𝑦+5﷯𝑑𝑦− 3𝑦+2𝑥+4﷯𝑑𝑥=0 •	Differential equation can be written as 4𝑥+6𝑦+5﷯𝑑𝑦− 3𝑦+2𝑥+4﷯𝑑𝑥 𝑑𝑦﷮𝑑𝑥﷯ = (3𝑦 + 2𝑥 + 4)﷮(4𝑥 + 6𝑦 + 5)﷯ Let F(x, y) = 𝑑𝑦﷮𝑑𝑥﷯ = (3𝑦 + 2𝑥 + 4)﷮(4𝑥 + 6𝑦 + 5)﷯ Finding F(𝜆x, 𝜆y) F(𝜆x, 𝜆y) = = 2𝜆𝑥 + 3𝜆𝑦 + 4﷮4𝜆𝑥 + 6𝜆𝑦 + 5﷯ ≠ 𝜆° F(x, y) ∴ The given equation is not homogenous Ex 9.5, 17 Which of the following is a homogeneous differential equation ? 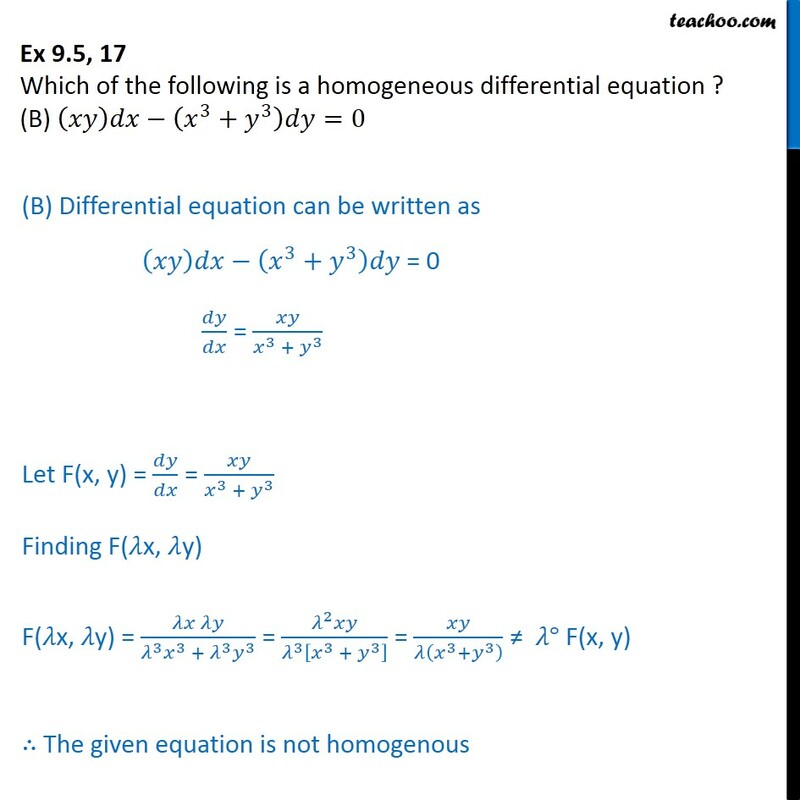 (B) 𝑥𝑦﷯𝑑𝑥− 𝑥﷮3﷯+ 𝑦﷮3﷯﷯𝑑𝑦=0 (B) Differential equation can be written as 𝑥𝑦﷯𝑑𝑥− 𝑥﷮3﷯+ 𝑦﷮3﷯﷯𝑑𝑦 = 0 𝑑𝑦﷮𝑑𝑥﷯ = 𝑥𝑦﷮ 𝑥﷮3﷯ + 𝑦﷮3﷯﷯ Let F(x, y) = 𝑑𝑦﷮𝑑𝑥﷯ = 𝑥𝑦﷮ 𝑥﷮3﷯ + 𝑦﷮3﷯﷯ Finding F(𝜆x, 𝜆y) F(𝜆x, 𝜆y) = 𝜆𝑥 𝜆𝑦﷮ 𝜆﷮3﷯ 𝑥﷮3﷯ + 𝜆﷮3﷯ 𝑦﷮3﷯﷯ = 𝜆﷮2﷯𝑥𝑦﷮ 𝜆﷮3﷯ 𝑥﷮3﷯ + 𝑦﷮3﷯﷯﷯ = 𝑥𝑦﷮𝜆 𝑥﷮3﷯+ 𝑦﷮3﷯﷯﷯ ≠ 𝜆° F(x, y) ∴ The given equation is not homogenous Ex 9.5, 17 Which of the following is a homogeneous differential equation ? (C) 𝑥﷮3﷯+2 𝑦﷮2﷯﷯𝑑𝑥+2𝑥𝑦 𝑑𝑦=0 𝑥﷮3﷯+2 𝑦﷮2﷯﷯𝑑𝑥+2𝑥𝑦 𝑑𝑦=0 (x3 + 2y2) dx = −2xy dy 𝑑𝑦﷮𝑑𝑥﷯ = −( 𝑥﷮3﷯+2 𝑦﷮2﷯)﷮2𝑥𝑦﷯ Let F(x, y) = 𝑑𝑦﷮𝑑𝑥﷯ = −( 𝑥﷮3﷯+2 𝑦﷮2﷯)﷮2𝑥𝑦﷯ Finding F(𝜆x, 𝜆y) F(𝜆x, 𝜆y) = −( 𝜆﷮3﷯ 𝑥﷮3﷯ + 2 𝜆﷮2﷯ 𝑦﷮2﷯)﷮2𝜆𝑥𝜆𝑦﷯ = − 6𝑥﷮3﷯ + 2 𝑦﷮2﷯﷮2𝑥𝑦﷯ ≠ 𝜆° F(x, y) ∴ The given equation is not homogenous Ex 9.5, 17 Which of the following is a homogeneous differential equation ? (D) 𝑦﷮2﷯𝑑𝑥+ 𝑥﷮2﷯+𝑥𝑦− 𝑦﷮2﷯﷯𝑑𝑦=0 y2 dx + (x2 − xy − y2) dy = 0 y2 dx = (x2 − xy − y2)dy 𝑑𝑦﷮𝑑𝑥﷯ = 𝑦﷮2﷯﷮ 𝑥﷮2﷯ − 𝑥𝑦 − 𝑦2﷯ Let F(x, y) = 𝑑𝑦﷮𝑑𝑥﷯ = 𝑦﷮2﷯﷮ 𝑥﷮2﷯ − 𝑥𝑦 − 𝑦2﷯ Finding F(𝜆x, 𝜆y) F(𝜆x, 𝜆y) = − 𝜆﷮2 ﷯𝑦﷮2﷯﷮ 𝜆﷮2 ﷯( 𝑥﷮2﷯ − 𝑥𝑦 − 𝑦2)﷯ = 𝑦﷮2﷯﷮ 𝑥﷮2﷯ − 𝑥𝑦 − 𝑦2﷯ = 𝜆°F (x, y) F (x, y) is 𝑎 homogenous function of degree zero. 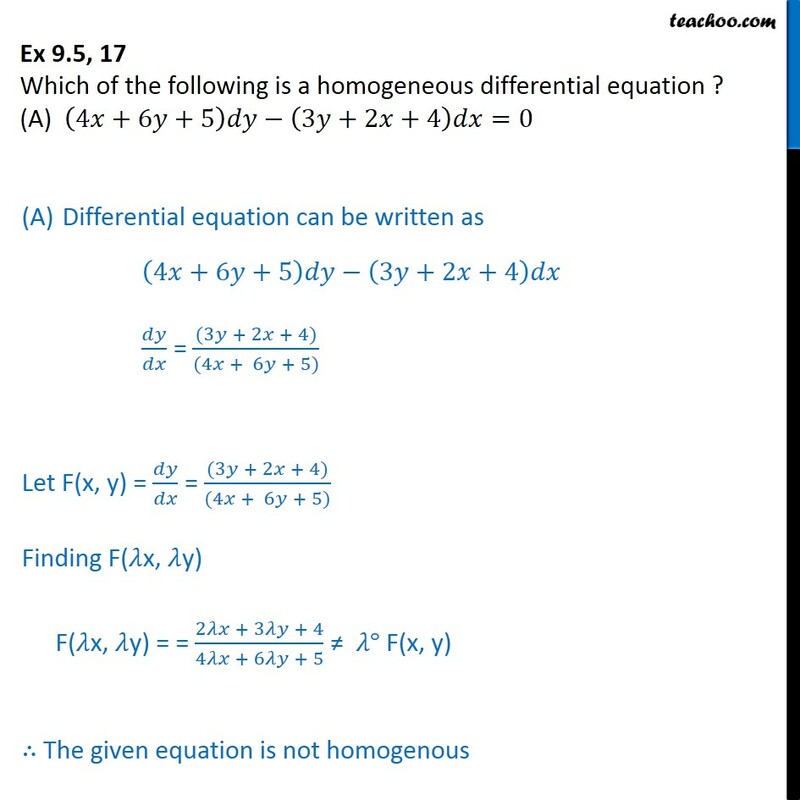 ∴ Given equation is a homogenous differential equation. 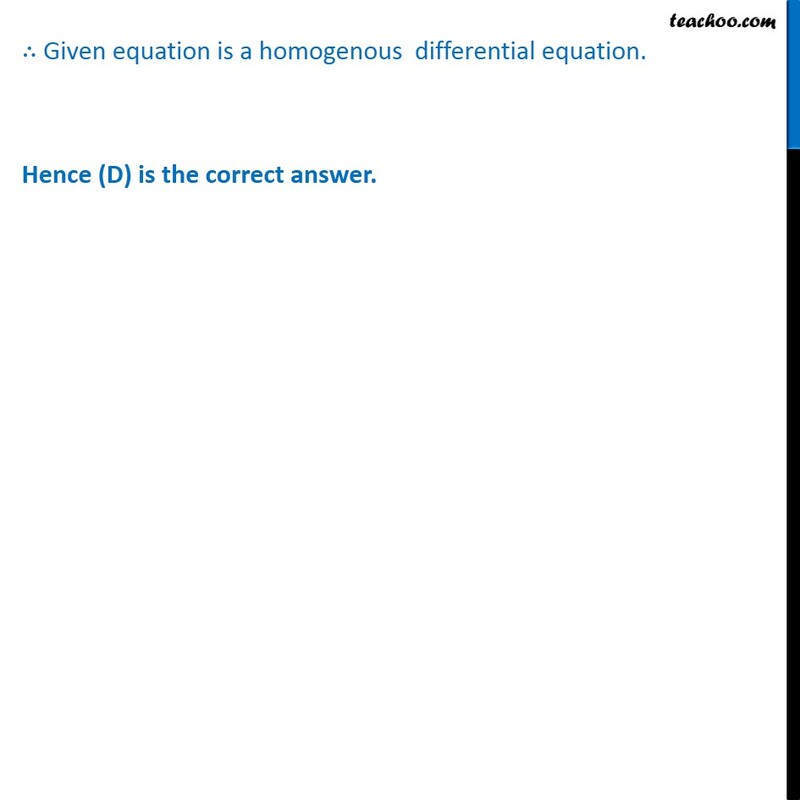 Hence (D) is the correct answer.